South African port terminal operator Transnet Port Terminals has taken delivery of four Liebherr ship to shore cranes and 18 rubber tyred gantry cranes. The 65 tonne ship to shore cranes offer an outreach of 65 metres, a span of 30.4 metres and a back reach of 19 metres. Designed to handle container vessels of up to 24 rows across, the cranes have a lift height of 41 metres. The rubber tyred gantry cranes, destined for Tansnet’s terminal in Ngqura, have a one over five configuration and can stack up to seven containers wide. Features include Liebherr’s DGPS auto steering and container location recognition systems, ultrasonic anti-collision systems and an eight-rope reeving anti-sway system. Cameras will also be fitted to monitor the long travel in both directions. In the last two years Liebherr has delivered nine mobile harbour cranes to Transnet Port Terminals. The ship to shore cranes in this order will bring the total number of Liebherr ship to shore cranes it operates to 31. 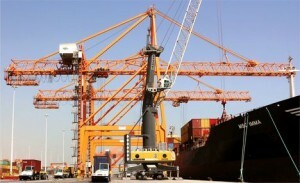 Liebherr Africa will conclude the order with the assistance of Liebherr Container Cranes in Ireland.